(Bloomberg) -- Carry traders are profiting as emerging-market currency volatility drops to a more than seven-month low. Buying higher yielding developing-nation currencies with borrowed dollars has returned almost 9 percent since early September amid expectations the Federal Reserve will be less aggressive raising interest rates and the U.S. and China will reach a trade deal. One-month implied volatility has fallen for 20 out of 22 emerging-market currencies tracked by Bloomberg this year and indexes of carry return are up for all three regions. “With developed-market central banks likely to do less rather than more and some positive economic surprises,” the carry trade has been a good bet, said Frances Hudson, a global strategist in Edinburgh at Aberdeen Standard Investments. Price swings are also dropping for equities. 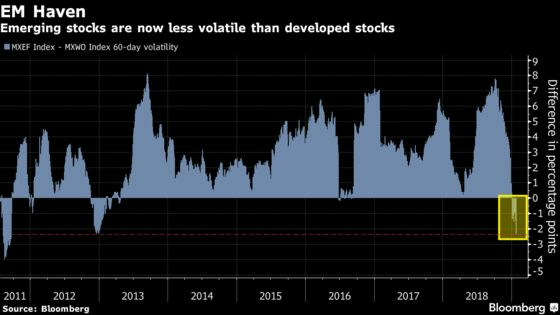 Emerging-market stocks’ 60-day volatility fell below that of developed markets for the first time in two-and-a-half years this month and the gap’s now the biggest in favor of the former since 2011. 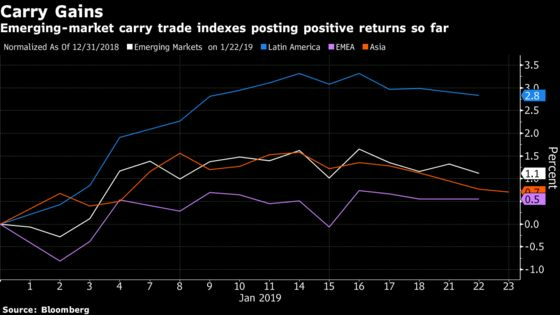 The resurgent carry trade represents a stark turnaround from last year, when the wager resulted in the worst losses since 2015 amid gains for the dollar and increased bets on higher interest rates. Over the past five years, the three best occasions to go long the emerging-market carry trade -- in February 2016, December 2016 and September 2018 -- coincided with peaks in currency volatility. Of course, skeptics remain about how long the good times can last -- with specific concern focused on the chances for price swings to return to emerging markets. Investors seeking to profit off higher local interest rates got burned in November 2016 after Donald Trump’s surprise election and August 2018 when a series of currency crises hit developing nations. 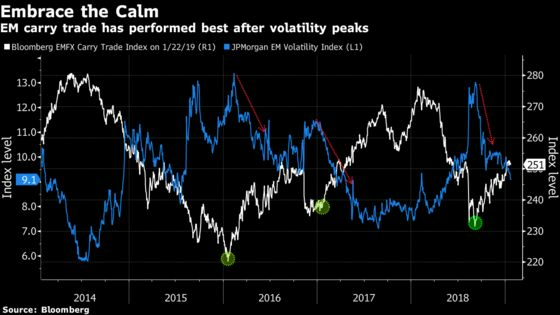 “When volatility spikes, every carry trader runs for the exit,” said Christian Lawrence, a strategist at Rabobank in New York. 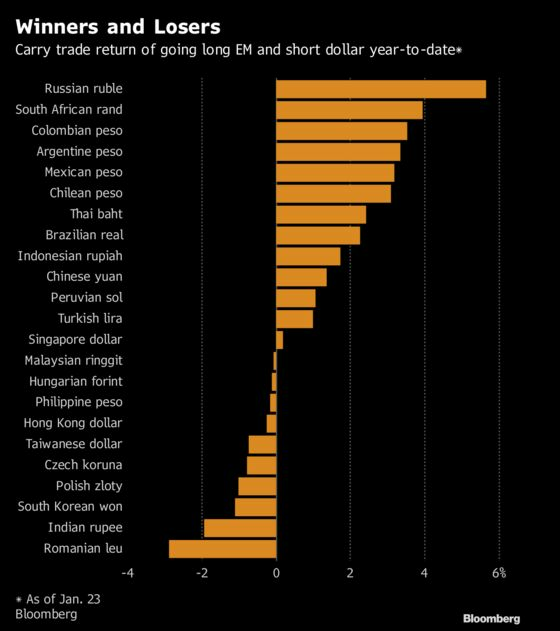 Lawrence says liquidity is a top priority, and his top bet based on projections for volatility-adjusted carry is the Turkish lira, followed by Indonesia’s rupiah, India’s rupee, Mexico’s peso and the Russian ruble. Buying the Mexican peso with borrowed dollars has returned more than 3 percent this year and 6 percent last year, when it was the only one providing a positive return. The winner this year is the Russian ruble, which has returned almost 6 percent. Brendan McKenna, a currency strategist at Wells Fargo in New York, also favors the Mexican peso and the Indonesian rupiah for carry gains due the wide rate differential, but he urges caution against big bets given the risk volatility could surge. Plenty of investors remain optimistic for now. “Global factors should not be not a big headwind to this tendency,” said Valentijn van Nieuwenhuijzen, chief investment officer for The Hague-based NN Investment Partners, which manages around $270 billion of assets. Brazil and the “fundamentally stronger” countries in Asia present carry-trade opportunities, he said at a conference in Warsaw.